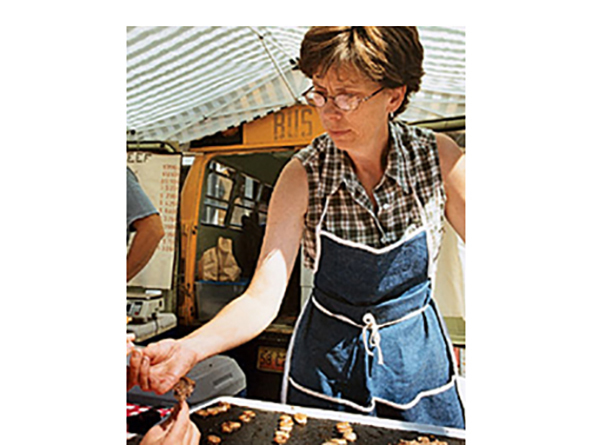 Above: Sen. Dubas prepares samples of her family farm’s sausage and bratwurst at the farmers’ market in Lincoln. When Sen. Annette Dubas responded to the Unicameral Update’s request for an interview, she called from her farm near Fullerton, she was out of breath. “The lights are flickering—I think we’re about to lose power,” she warned. The January snow storm that wreaked havoc for farmers and left parts of central Nebraska without electricity for, in some cases, weeks, was in full force. Dubas had just finished carrying buckets of water out to her cattle in freezing temperatures because their normal drinking supply had frozen solid. Still, she made time to return her phone calls. Being a farmer and a senator can be a juggling act. Dubas said her time has been spent preparing for the positions she’ll take on upcoming bills and arranging for the farm to be able to run without her. “I’ve run my own schedule for 30 years—farming is very flexible. Now I’m on a much more structured schedule,” she said. She’s grateful that her son and his wife, who also work on the family’s farm, can take up the slack. Both helped carry the load while she was campaigning, she said. Though born in Omaha, Dubas is a long-time Fullerton resident. Her father was originally from Fullerton, and when Dubas was 16, he noticed a local business was for sale while visiting family there. The family bought the local tavern and movie theater, and the city kids moved back to the country. Dubas married her high school sweetheart, a fourth-generation farmer. She and her husband, Ronald, have four grown children and two granddaughters. She has worked on the family farm ever since, where they raise 275 head of cattle. While she enjoys farming, it doesn’t leave time for hobbies, she said. “When you’re a farmer, the farm is pretty much your life,” she said. When her children were young, she had been involved in their school sports, so she still roots for the local football, basketball and track teams. “I also like to read anything, especially historical biographies,” she added. In fact, reading about political figures contributed to her interest in government. Dubas knows her time as a senator will be incredibly busy. It might be a nice change, but it will take some getting used to, she said. And being away from home is hard.